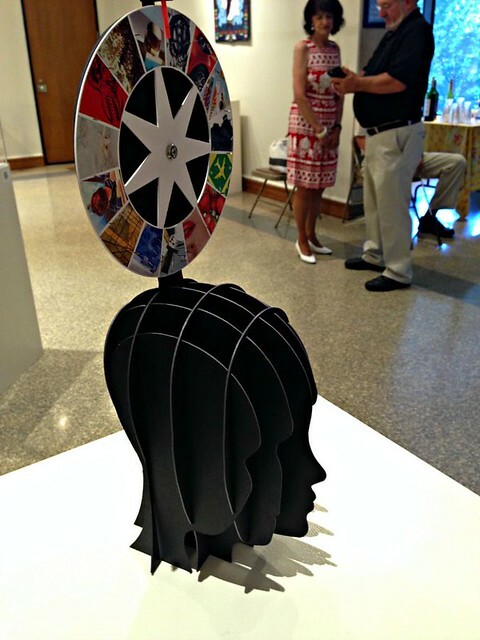 Recently I had the pleasure of attending the opening of artist Rob Kelly's exhibit Midway at The Delaware Division of the Arts Mezzanine Gallery in Wilmington. 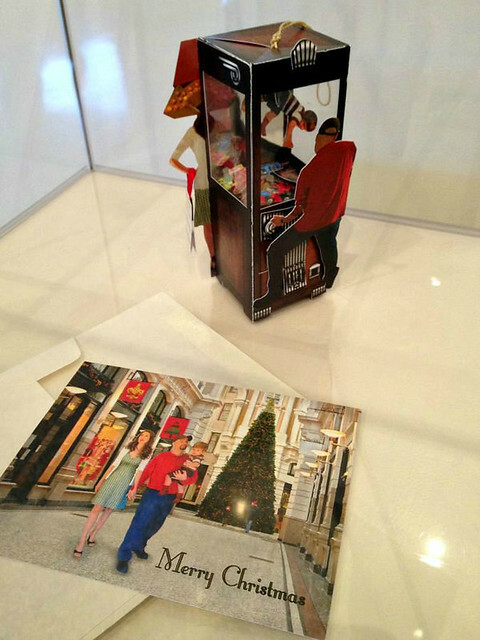 Last fall I featured the very cool pop-ups and other marvels Rob engineers from paper so check out that introduction to his fine work. Quite a few of the art pieces Rob has posted on his website were included in the show along with several new ones. 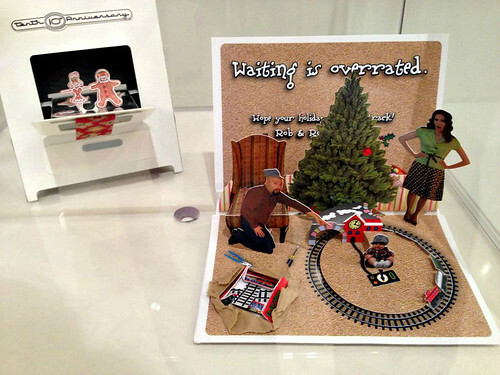 It was so nice to see his fun-and-games in person and to say hello to Rob and his wife Rose who, as I told them, I felt like I had already met simply because their images are often included on the Christmas pop-up cards that Rob designs each year. 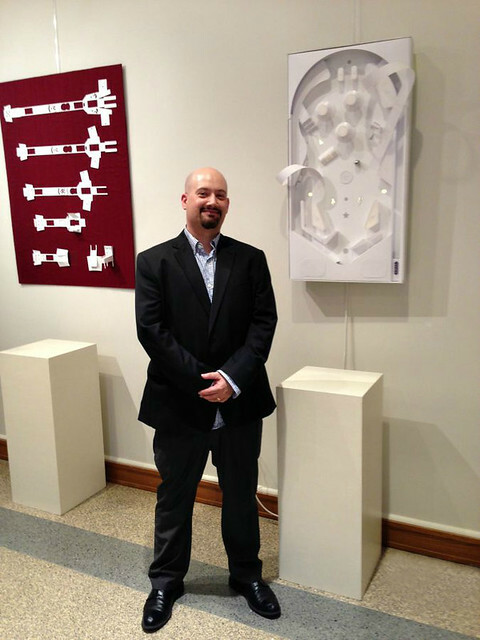 A wonderful inclusion Rob created for the exhibit is a QR code for each interactive piece. Use a smartphone to click the display case codes to see the engineering in action on YouTube. 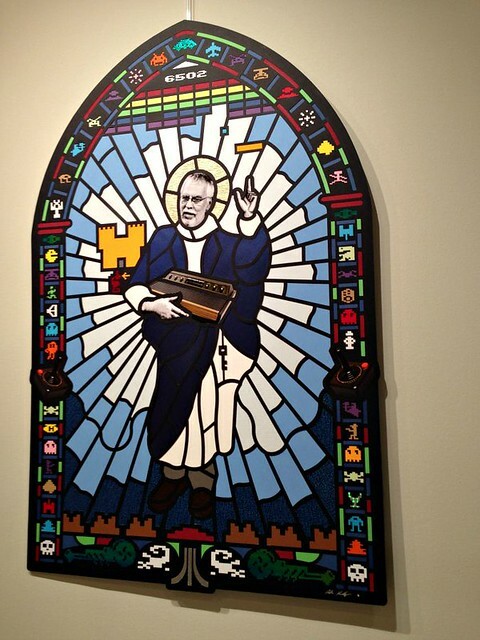 This piece is Rob's newest... a large stained 'glass' window of a gamer saint. He used many beautiful papers to create it and it shimmers in person. 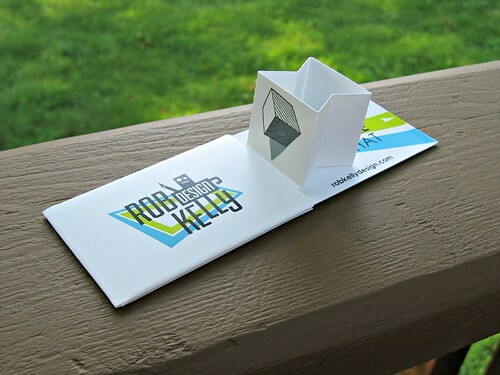 Rob's business card is one I won't soon discard. A pop-up slides out and the reverse side shows his contact info. Listen to an NPR interview with Rob about the exhibit here and if you're in the area, stop in to see it through the end of July. Thanks for this wonderful coverage of an artist I would have LOVED to have seen and met in person Ann! His business card is one that I would have treasured in my collection. I would have studied his cuts and engineering for hours if I could. I'm happy you enjoyed the post, Cecelia. 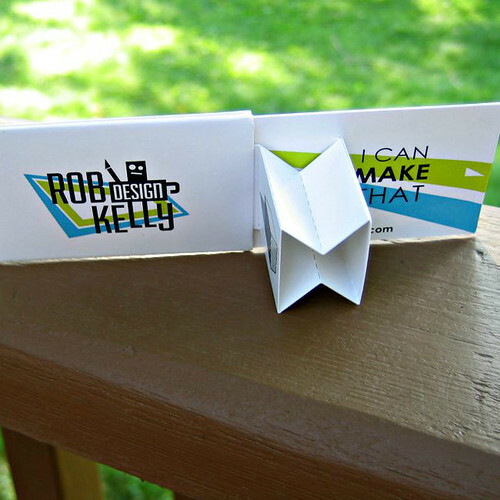 You and Rob have much in common with your analytical approaches to paper construction.